Oh my goodness I don't even really know where to start with this post-but it's probably the one I get asked most to write. Following my recent newly single status I decided to completely revamp my bedroom and my make up storage and therefore, now seems like a good time to give you a little tour. I've spent a lot of time researching storage options and I am totally happy with how it is set up now. There was literally one week in March where I was either in Ikea or the Ikea men were round at my apartment and I bought most of the inner storage from Muji or from Amazon. 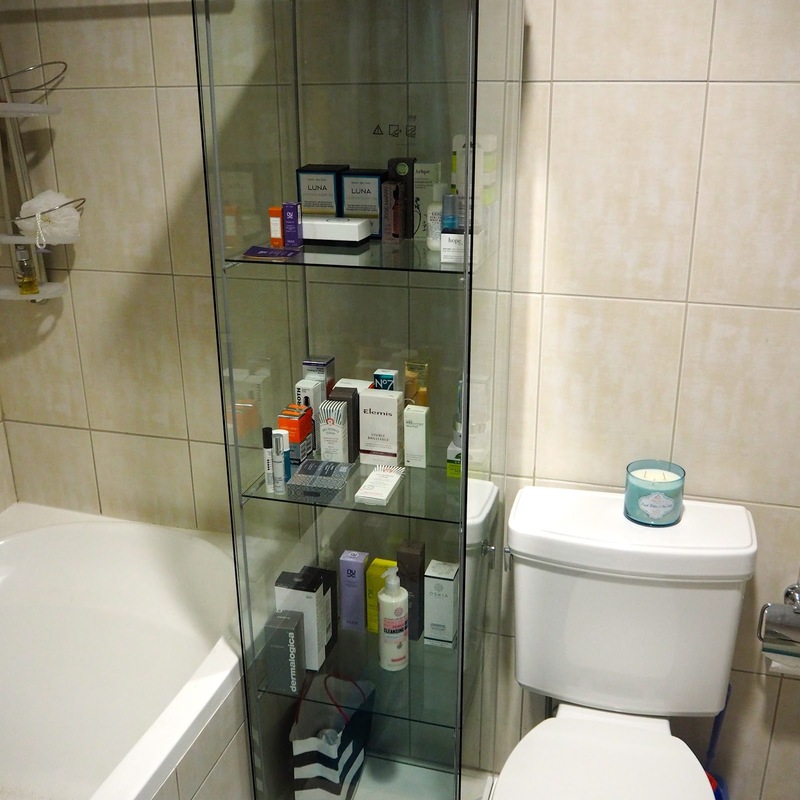 First up, the actual vanity area. This is where I sit and do my make up daily. The Simple Human mirror is amazing and I couldn't be without it-it's super pricey though-I got mine online from Lakeland. I've tried to keep my actual dressing table very uncluttered. Before the changes I made recently, this furniture was all dark wood and I had a large desk piled high with Muji Acrylic boxes. It was overwhelming and I felt it was messy. So I have gone for a much more streamlined approach and I love it. 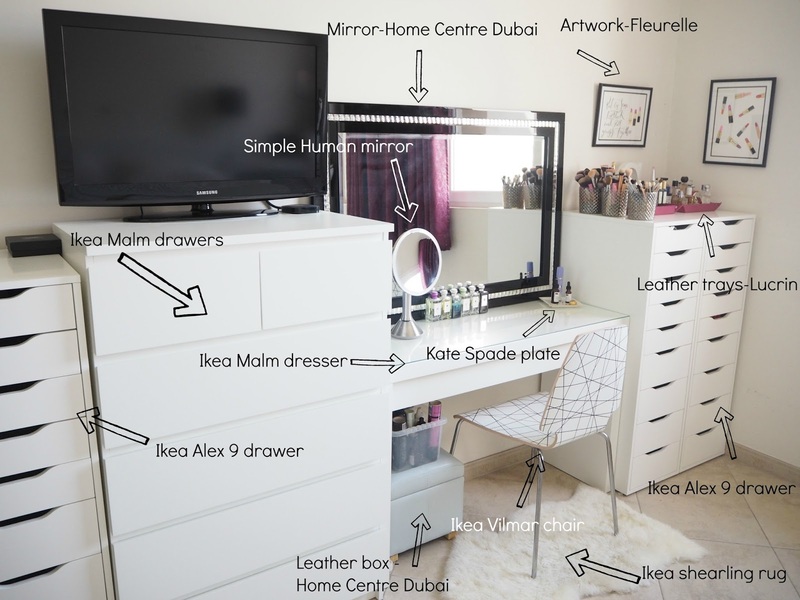 The Malm dressing table is a blogger fave and a bit cliched but it works. I keep minimal make up on the dressing table and the things I use every day in the dressing table drawer. I think my Jo Malone 100ml perfumes look pretty lined up against the mirror and the Kate Spade plate was an amazing gift from my beautiful friend Hannah. On there I just keep a couple of skincare bits I am using and I tend to take my rings off and put them there at the end of the day. 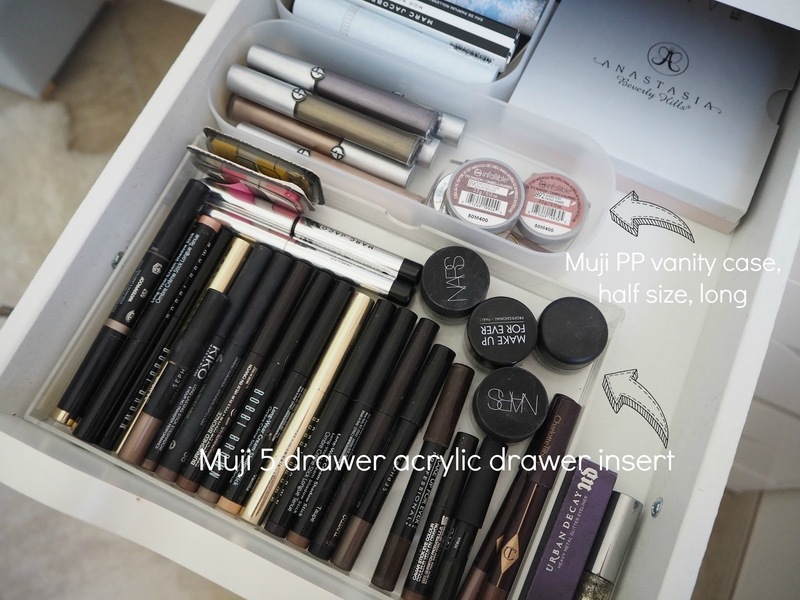 The Muji Acrylic 6 drawer unit is perfect for storing all my eyeliners and lipliners. 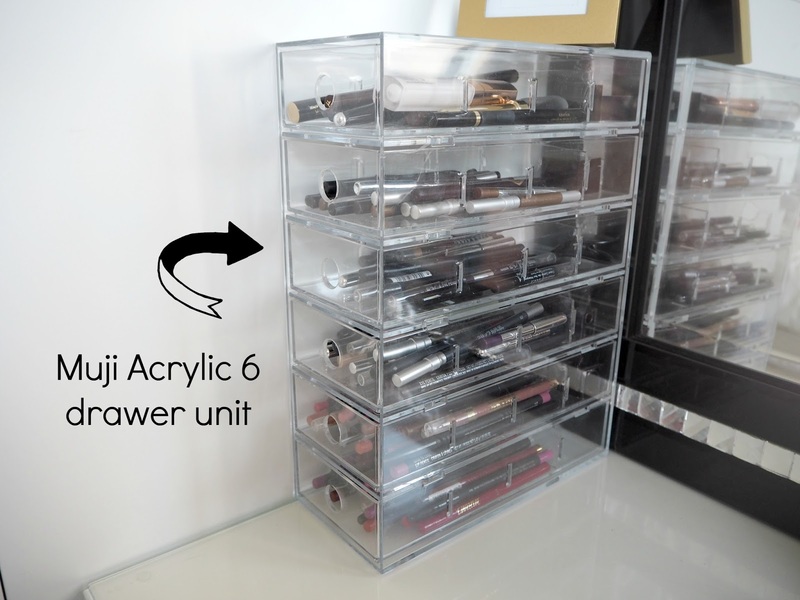 I couldn't find the exact one on the Muji website but I found the PP version-Muji 6 drawer PP unit and here is a Muji 4 drawer acrylic unit that is the same but smaller. I'm utterly obsessed with it. I use 4 drawers for eyeliner and 2 for lipliners. I love the fact that the drawers come with dividers. I have removed them all apart from the one at the back and I use that small section to store sharpeners and it just works so well. In the dresser drawer I have 3 Muji PP Vanity case-half size-long for brushes-I have concealer brushes, brushes I use for highlighing and one for various eyeliner brushes. 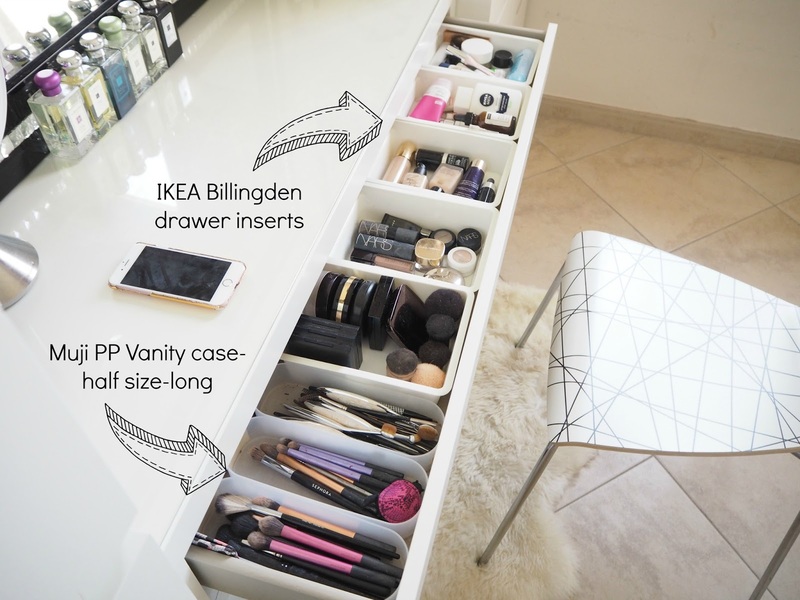 I then have 5 Ikea Billingden drawer insert lined up with all the things I use every single day. The Billingden is divided into a large section at the front and a smaller section at the back so I use it to section off smaller/slimmer items like concealers or mascaras. What you see in these drawers are pretty much my staples right now. ..is a cat obviously! I have two Ikea Alex 9 drawer units to one side of my dressing table and they are proving to be utterly perfect for my needs. Here I store the bulk of my perfumes and my make up brushes. I also have 2 Fleurelle illustrations hung up which I love. I found Emily on instagram and I love her work and have bought quite a few pieces for friends now as well as myself. I have stored my perfumes for years on Lucrin large leather catchall trays in Fuchsia and I have them monogrammed with my initials. I chose the grain leather as it's so hardwearing and they still look as good as they day I bought them. I have a wooden letter S from Ace Hardware (the Dubai B&Q equivalent) and my glass brush holders come from a local furniture shop called The One. They're just large glass candle holders. I'll quickly show you the other side of my room which is also all new-and the cats! I love the Ikea Brimnes 3 drawer , the drawers are really deep. I have a third alex here-I call this my 'spare' Alex and this is full of my spare make up. I do have a fourth Alex which you can see in the second picture in this post to the left of my dressing table but this is mostly empty at the moment. All the illustrations are again from Fleurelle apart from the bird coming out of the darkness which is by my friend Heidi-she also has an instagram page and a facebook page. The tray on my bedside table is another from Lucrin in the smooth leather rather than the grained leather and is in the colour turquoise. In here I keep some treasured possessions and handy bits like lip balm. 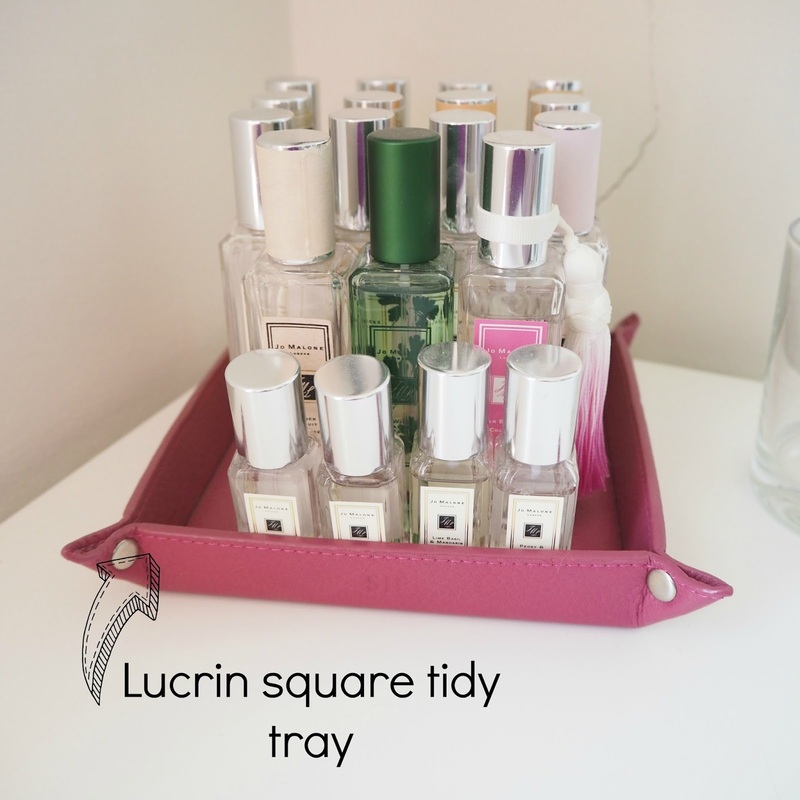 On top of the 'spare' Alex I keep a smaller Lucrin Square Tidy Tray in Fuchsia with all my 30ml and mini Jo Malone perfumes and there is an empty Diptyque candle on there at the moment too. 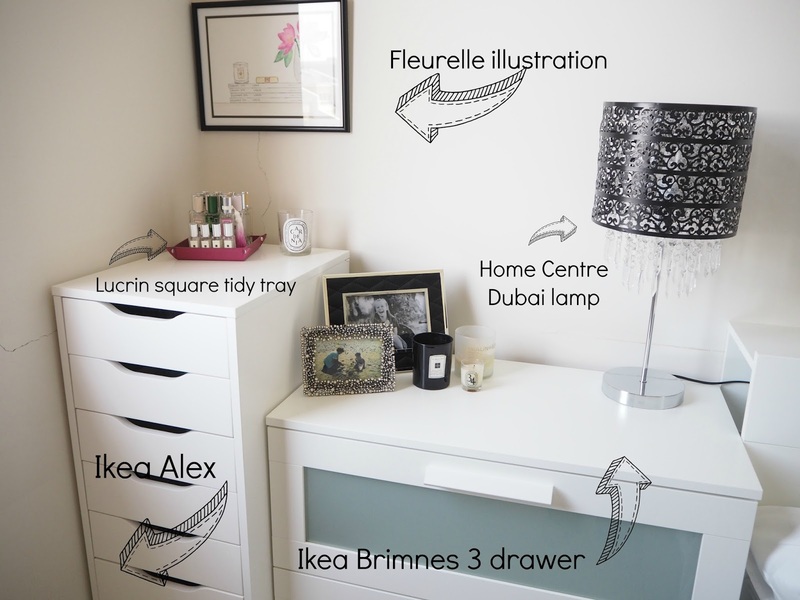 Here's a quick run down of what is in each of the Alex drawers to the right of my dressing table-going from top to bottom and left drawer first then the one on the right. 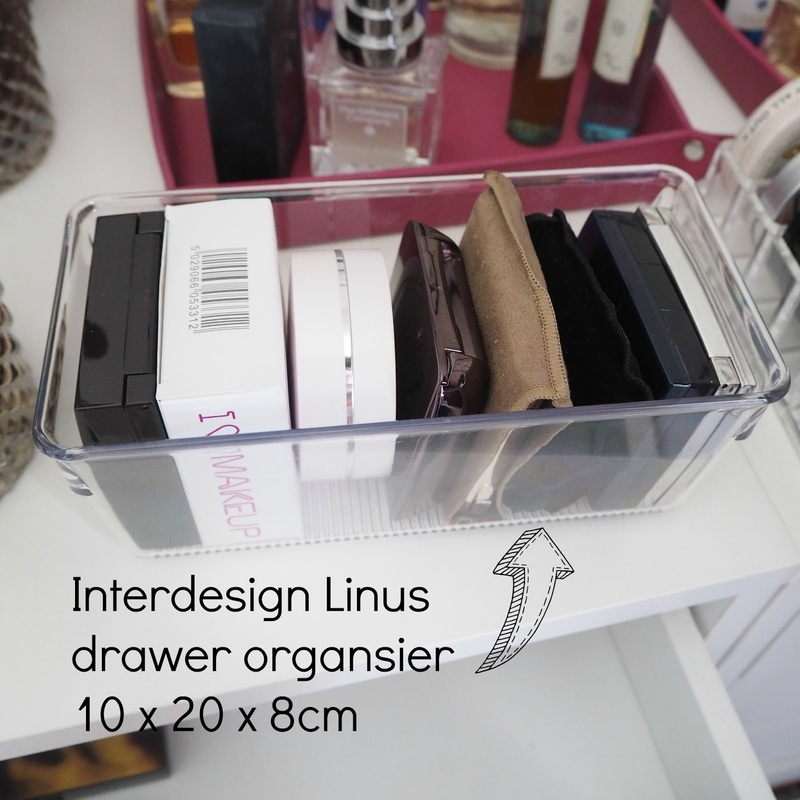 Interdesign Linus drawer organiser 10cm x 20cm x 8cm which works brilliantly for larger compacts. You'll see I have a few of these. Even though the containers are quite deep they fit into the narrower drawers at the top perfectly. Interdesign Linus Cutlery drawer 2, clear and I have organised them by brand. From left to right are all powder shadows and then the right column stores cream eyeshadows. What you see in here is mainly Urban Decay, Gucci, Stila, NARS, MAC (mainly ones that can't be depotted like the MAC Extra Dimension shadows), L'Oreal and then cream products from Chanel, Charlotte Tilbury and Make Up Forever. I also have two of the NARS mini palettes in here and one rogue NARS larger palette. Drawer 3-Eyeshadow crayons, liquid eyeshadow, rollerball perfume and Glow palettes! In here I keep all my eyeshadow crayons and cream shadow sticks inside a Muji Acrylic box 5 drawer insert that I took out of my old acrylic storage. I also have a Muji PP Vanity case-half size-long where I keep my Armani Eye Tints and L'Oreal Infallible pigments and then behind that I keep my rollerball perfumes and 2 recent purchases-the Anastasia Glow palettes. In this drawer I have three of the inserts from the Muji Acrylic box 5 drawer and I have my MAC powder blushers at the front and then two drawers stacked one on top of the other with various cream blushers in. I also keep 3 small blush palettes in here-one from Bobbi Brown and 2 from NARS. One of my favourite drawers because it looks neat and tidy is my second blush drawer. In here the blushers are by brand-Hourglass, Tarte, Chanel and NARS. They all stack nicely inside a Muji PP Vanity case-half size-long. I also keep in here a broken Tarte blush palette from a couple of Xmases ago and some large blush palettes at the back. From the 6th drawer the drawers get deeper allowing you to store taller items. This drawer holds a multitude of random but useful things-some spare lip balms, all my setting sprays, my cotton buds, dirty brushes that need washing, tissues and my point and shoot cameras. Plus some bioderma and cotton pads. In here is my main lipstick storage, arranged by brand in acrylic lipstick holders-these are the ones I have-BINO acrylic lipstick holder. 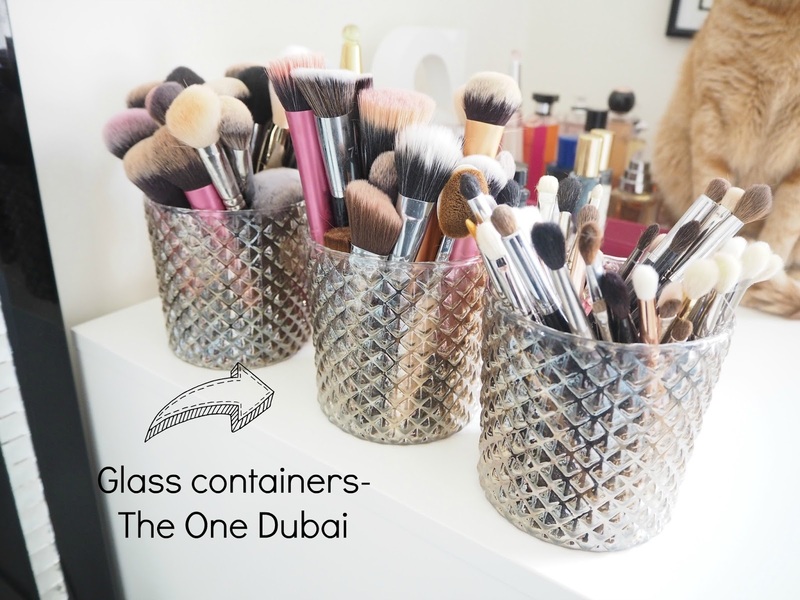 For larger based lipsticks I use this Muji Acrylic Desk Pot 3 partition storage. In here, as you can see is mainly Charlotte Tilbury, Dior, NARS, Bite, Burberry and Estee Lauder. In the Muji PP vanity case-half size width there are some more odd shaped lipsticks and a couple of gloss pots. This is the storage I am most proud of discovering!! I have a lot of MAC lipsticks but I wanted to store them upside down so that I could see the shade. I tried a few things but the lipsticks slanted or fell over and then I hit on the idea of storing them in test tube holders. I actually measured the MAC lipsticks diameter and bought ones with 20mm slots-are they are perfect. So utterly perfect. Yes they're a little ugly but they work a treat and they were so cheap. I bought Seoh Test Tube Plastic Rack 20mm. In the bottom drawer I have more lipsticks-these are all new and unused and in either acrylic lipstick holders or still in their packaging. At the back are some mini lipsticks in a Muji PP half width vanity case. Here I store more eyeshadows-my NARS duo eyeshadows are in a Muji PP basket 2, my MAC quads in an Interdesign Linus drawer organiser 10cm x 20cm x 8cm and then my 3 MAC Pro Palettes lay to the side. 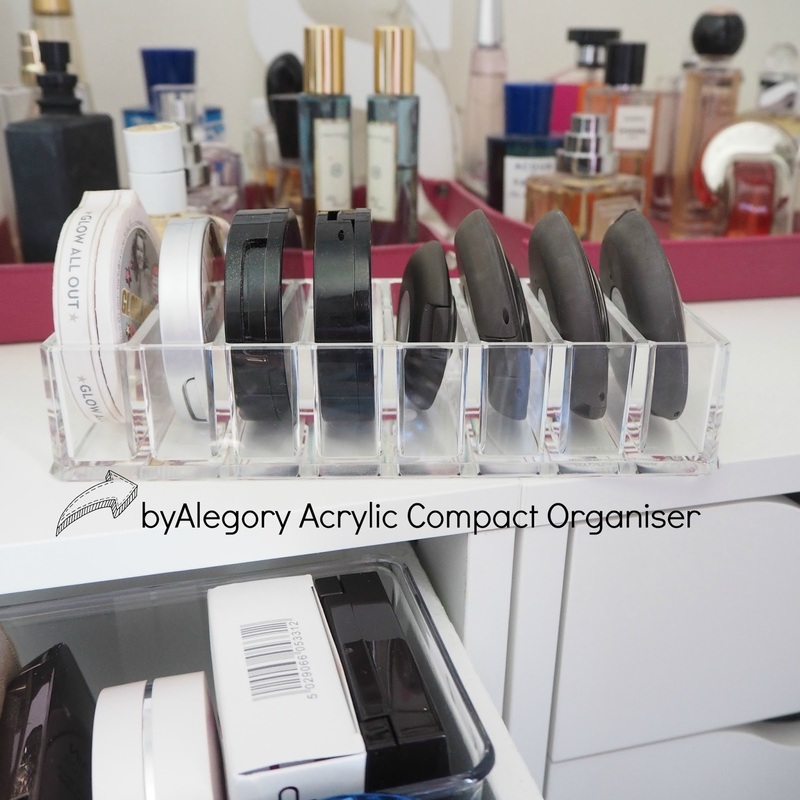 Behind them I have a byAlegory acrylic eyeshadow organiser 16 space which is perfect for storing individual shadows-at the moment I only hold a couple of depotted MAC shadows and one MAC shadow. This is a real mish mash of a drawer. The main bit is all my Colour Pop eyeshadows, laid flat so I can see them inside a Muji Acrylic box 5 drawer. 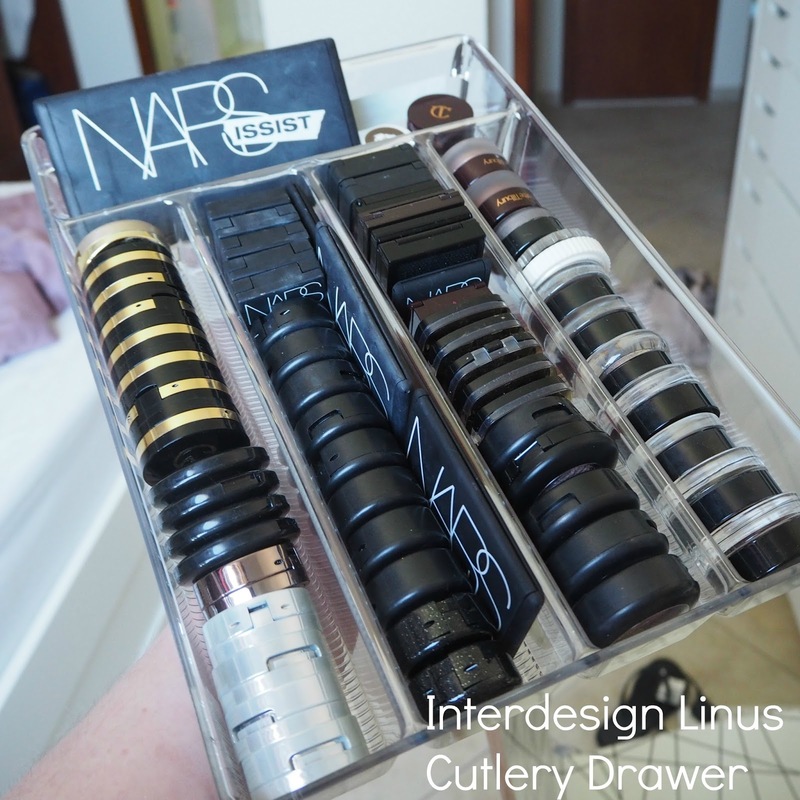 Behind that I have 2 more Interdesign Linus drawer organiser 10cm x 20cm x 8cm filled with a lot of miscellaneous brand palettes-I can see Burberry, YSL, Lancome, Illamasqua etc. Then to the back and side more palettes that are odd shapes and don't really fit anywhere-my Inglot freedom system palettes, Marc Jacobs and Becca slim palettes for example. In this drawer I store all my bronzers and loose pigments inside a Whitmor 3 section drawer organiser. The three sections make it easy to keep things separate. To the right I also keep my contour palettes or larger bronzers-these are mainly still in their boxes and lie flat. I use another Ikea Billingden drawer insert to store various brands of blusher-I tried to store them in size order-I have some Kiko and Clinique and Dior in here. It's mainly brands I have only one or two of. And then in 2 more Interdesign Linus drawer organiser 10cm x 20cm x 8cm I keep blushers by brand-Illamasqua, Benefit, Charlotte Tilbury and two of the MAC Proenzer Schouler limited edition blushes. In here I store my Tom Ford lipsticks inside a byAlegory oversized acrylic lipstick holder-these are especially designed for larger based lipsticks and so fit the Tom Ford and also I have in here the Armani Rouge Ecstasy lipsticks which I love. I have my 'lips and boys' to the right hand side just loose and then at the back I store my liquid lipsticks and lip crayons in a Muji insert. This is a loose drawer that I store palettes in by size order-I have Too Faced, my Z palettes, all my Urban Decay, Zoeva etc in here. Inside an Interdesign Utensil Organiser I keep all my Dior quint palettes, my Tom Ford eyeshadows and then a few random smaller palettes like my Burberry singles, Kevyn Aucoin duos and Chanel singles. I like the way I can just stack them in a line so I can easily see and reach for them. I love this storage! I found the Cici and Sisi Acrylic lipgloss holder on Amazon and it's so perfect for all my glosses and pencils. I have all sorts stored in here and again, arrange by brand. At the back I store my MAC lip glosses and some small sized glosses inside a Muji PP make up tray. Right at the bottom I store my stash of foundations and concealers, primers and eyeshadow primers. I keep the bulk of it inside these Ikea Variera storage box and it's relatively easy to see everything in there. Moving onto my 'spare' Alex here is a run down, from top to bottom of what I keep inside. Top drawer has mini nail polishes from the Ciate advent calender, my spare beauty blenders/sponges, my Louboutin polish and my MAC pro palette inserts. I also have a limited edition Paul and Joe Alice in Wonderland case in there because I love Alice in Wonderland! Drawer two is back ups of my Eucerin Aquaphor which is the best lip balm ever. I also have back ups of the Sephora make up wipes and make up removing cotton buds for clearing up smudges and I also have random lip balms in here. Drawer three is lashes! Currently obsessed with Huda Beauty and Pinky Goat-two UAE based brands. I also have some Esqido, Eyelure and MAC. Drawer four doesn't have a lot in-some spare compact powders, blushes and finishing powder. Drawer 5 contains eyeshadow palettes I haven't used yet-I have a bit of an addiction to palettes clearly! Drawer six is mascaras-I have drugstore at the back, samples in the middle and high end at the front. These are all new and unused-I limit myself to having two mascaras open at a time for hygiene reasons. As you can see I am not loyal to any brand here-I will try anything. Drawer 7 holds nail varnish removers and base/top coats. It also holds my empties inside an Ikea Skubb insert and my 'back to MAC' and products I don't like for a 'disappointing products' post which just sit in a Muji PP make up tray. Drawer 8 proves I have a lip product problem! These are all brand new and unused lip products-mainly glosses, stains and lip crayons. They're piled up inside a Muji Vanity Box with lid but there is overspill! So many lip products!! Drawer 8 is one of my favourites-all my nail polishes sit in here by brand. But, I have become addicted to gel manicures and so I barely use these any more. If you're still here reading this post then I salute you and I literally just want to quickly show you two more things-how I store my Lush products and how I store my skincare. And I will be brief I promise. I store my Lush products in this glass jar drinks dispenser. I bought mine from Home Centre in Dubai which is a local furniture store but you can buy similar from amazon-like this one. so I could keep all similar products together. The first one holds skin oils and moisturisers on the top shelf, serums on the next shelf, cleansers on the following shelf and at the bottom I have a Sephora bag that holds samples. 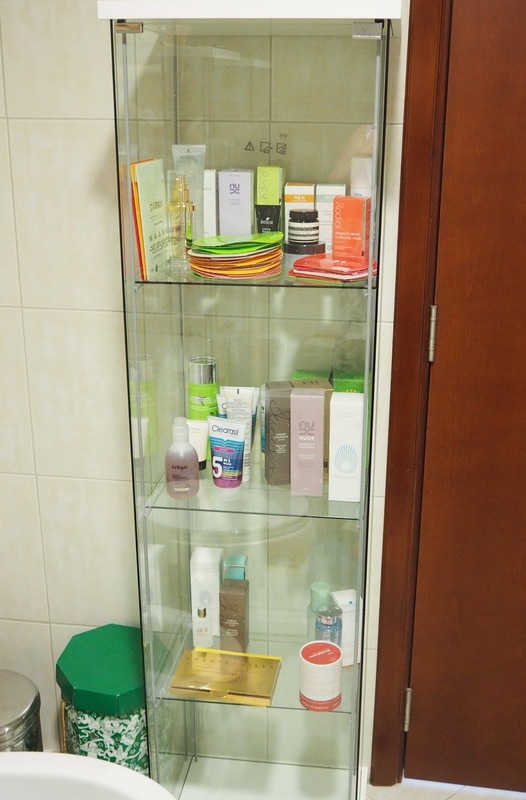 In the second one I keep face masks and sheet masks, more cleansers and finally toners. By keeping them in here I can see everything when I am shopping my stash. So that's it! 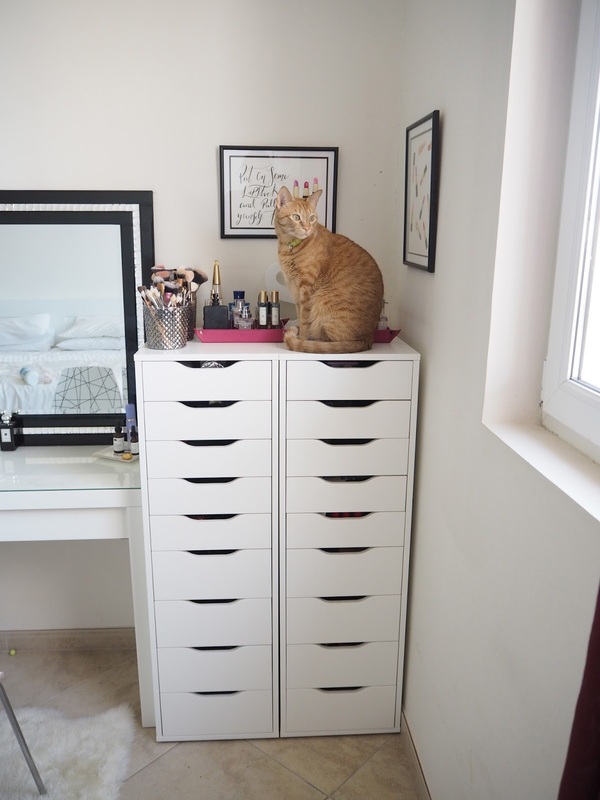 You have reached the end of my make up storage/vanity/bedroom tour! I hope it was useful! 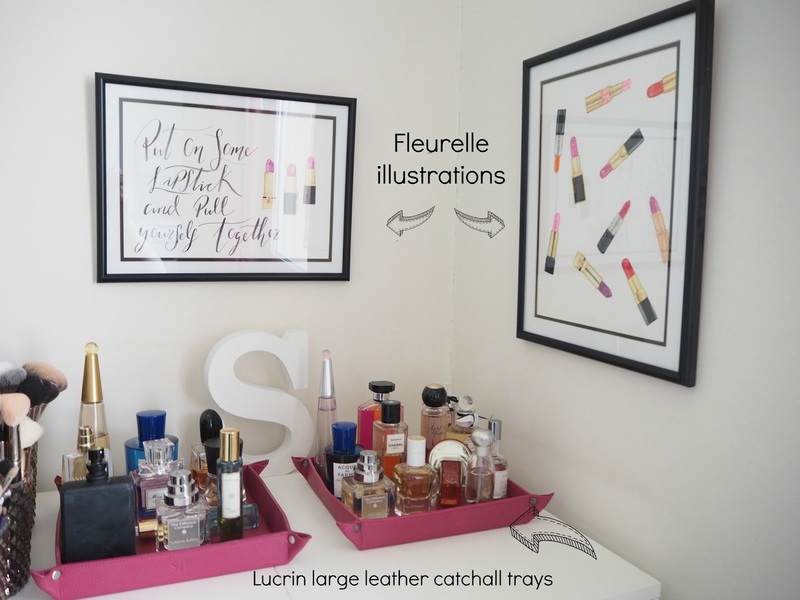 Just to say, this post contains no affiliate links, these are just the products that I researched, found and bought myself and think you might find useful for storing your make up!